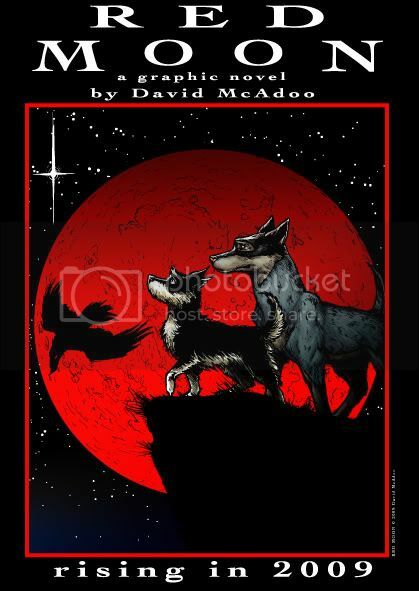 Red Moon is a groundbreaking graphic novel set to be released in early 2009. At RedMoonGraphicNovel.com you will be with us as we create the book, publish it and travel to a city near you to sell the it at comic book conventions all across the country. You'll also get insider info and sneak peeks of Red Moon. Plus, we'll have some surprises and contests for you along the way as well! Red Moon is a story of the power of nature, the essence of destiny and the bond between all living things. The story begins with Mox, a family dog that has recently been freed from his pen by Daeden, a local stray dog. As Mox explores his independence he begins having horrific visions of the world in chaos beneath a haunting red moon. The two dogs then embark on an adventure full of dangerous enemies, powerful allies and mystical sages of the animal world to find out what the visions mean.